Production on Marvel sequel Guardians of the Galaxy Vol. 2 is beginning to wind down, according to James Gunn, now that both Karen Gillan and Dave Bautista have completed filming their scenes. Taking to his lively social feeds, Gunn confirmed that both Gillan and Bautista had all but wrapped up work on Guardians 2, and it’s likely that their leading co-stars aren’t too far behind. 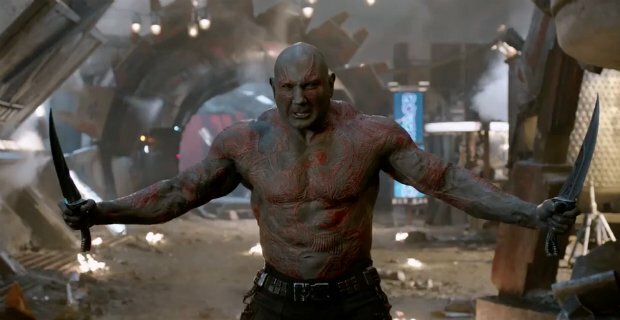 Perhaps most interesting of all is that the filmmaker went on to claim that Dave Bautista “steals the movie” as dim-witted adventurer Drax the Destroyer. It’ll be some time yet before moviegoers give their own verdict on Bautista’s performance in the spacefaring sequel – Guardians 2 isn’t due to arrive until May of next year – but if the 2014 original is any indication, expect plenty more rambling monologues and, er, ‘metaphors’ to feature. And that’s a wrap on @DaveBautista on #GotGVol2 ?????? PS I’ll miss you, pal. PPS He steals the movie. Chris Pratt will reprise his defining role as Star-Lord, joined in the cockpit of Milano by Zoe Saldana’ Gamora, Dave Bautista’s Drax, Bradley Cooper’s pint-sized Rocket Raccoon and Vin Diesel as Groot. Beyond that Karen Gillan (Nebula) and Michael Rooker (Yondu) are on board, too, while there’s also room for franchise newcomers Pom Klementieff as Mantis, Tommy Flanagan as a henchmen of Yondu and, potentially, Sylvester Stallone. Guardians of the Galaxy Vol. 2 is slated for release on May 5, 2017.